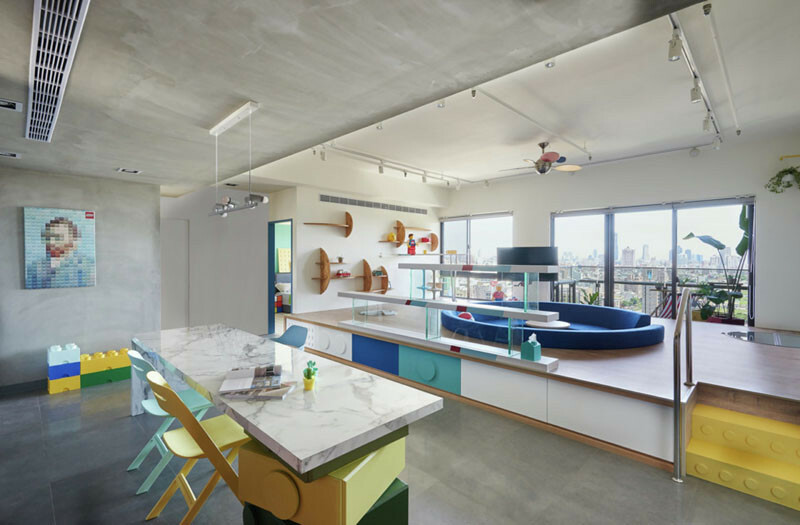 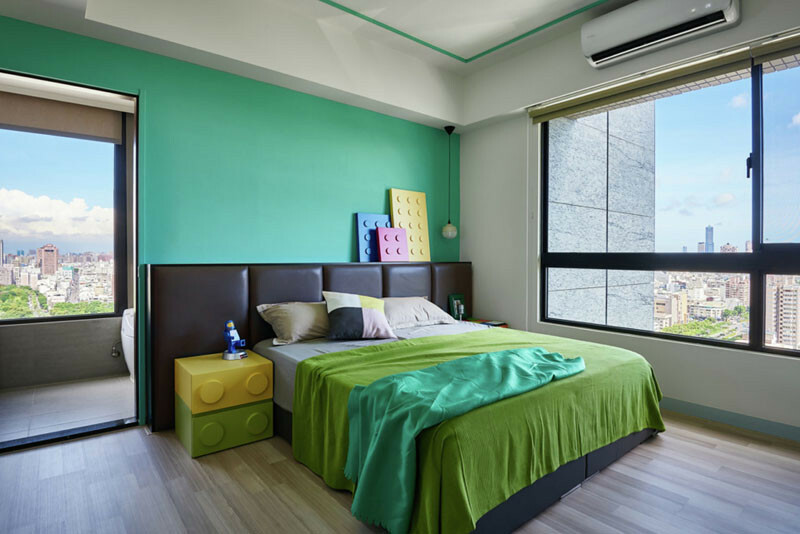 HAO Design created this apartment interior in Taiwan, that’s all about making imaginative, playful spaces. 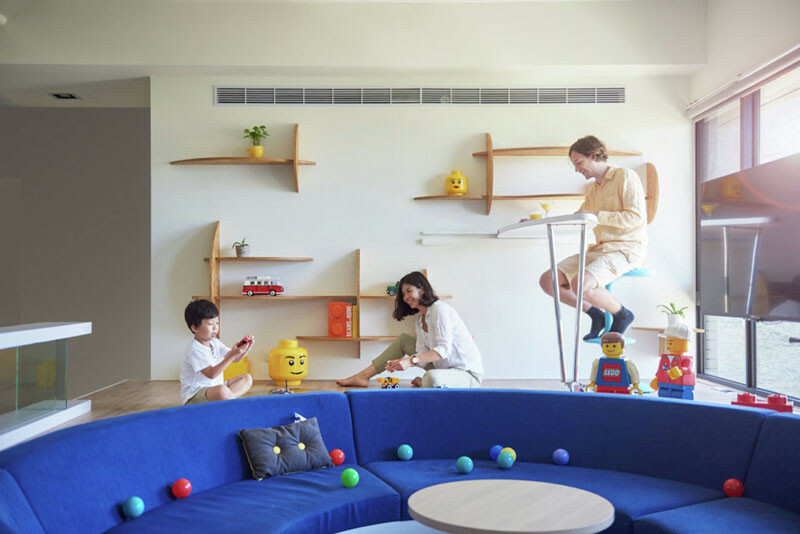 The clients have a love of Lego, and wanted to bring the idea of a swimming pool inside, but instead of being filled with water, they wanted it to be a lounge, playspace and toy storage. 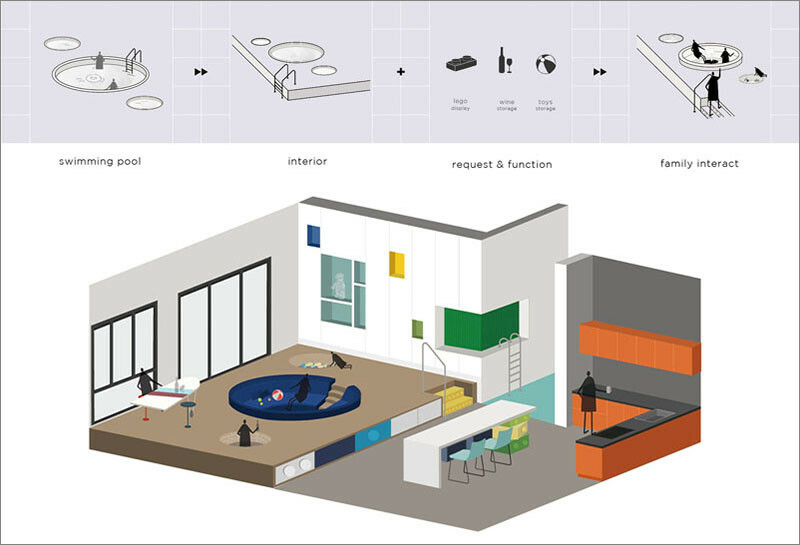 The Lego Play Pond is located within a raised level of the home, which acts kind of like a pool deck. 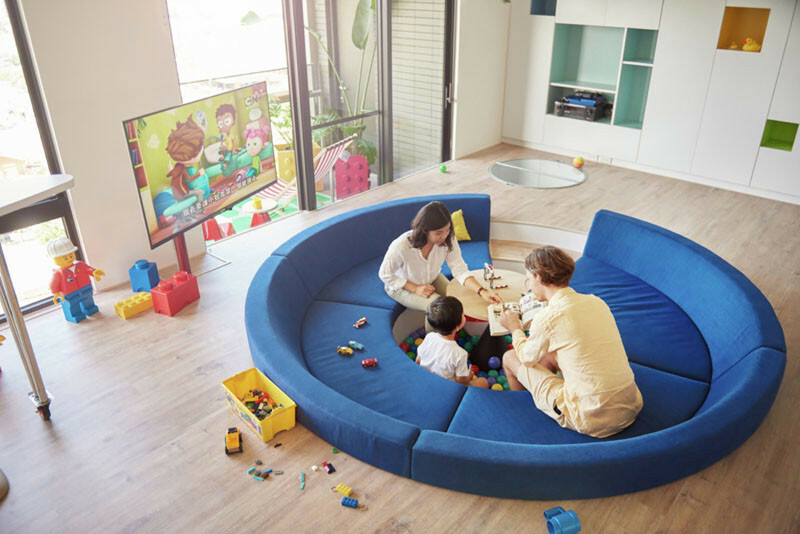 The round blue sofa, with its central depression, resembles a swimming pool or ball-pit, and creates a summertime atmosphere. 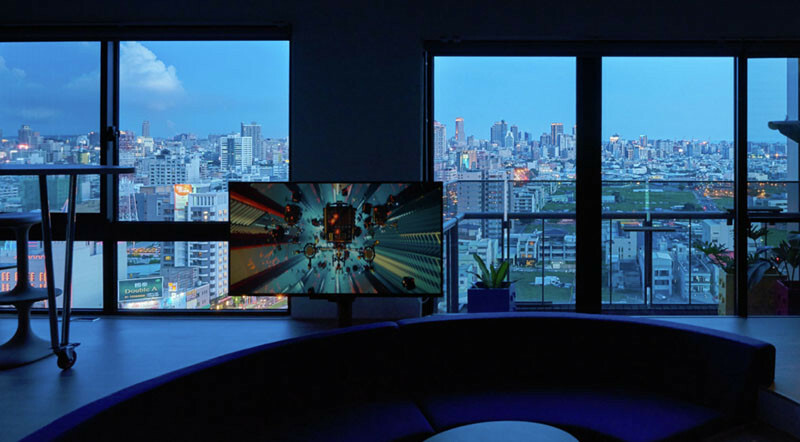 At night, it’s the perfect spot for enjoying a movie. 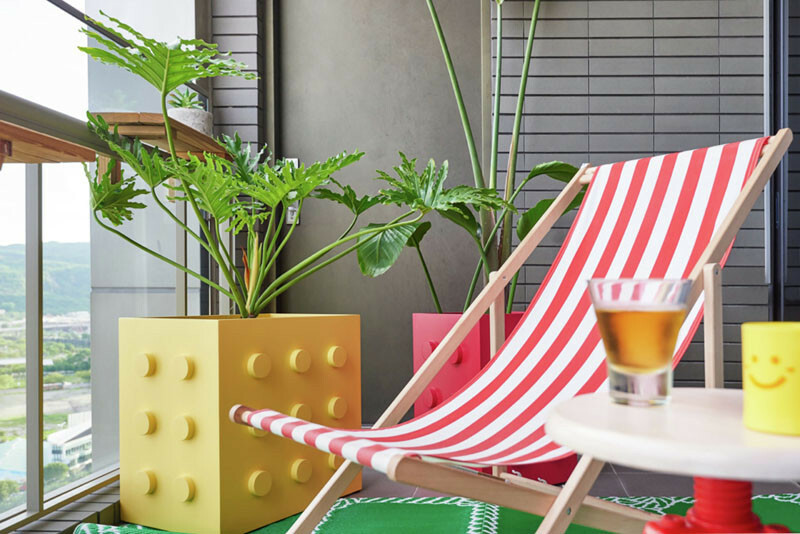 Just outside on the balcony, there are Lego-inspired planters, a green mat representing grass, and a beach chair for relaxing. 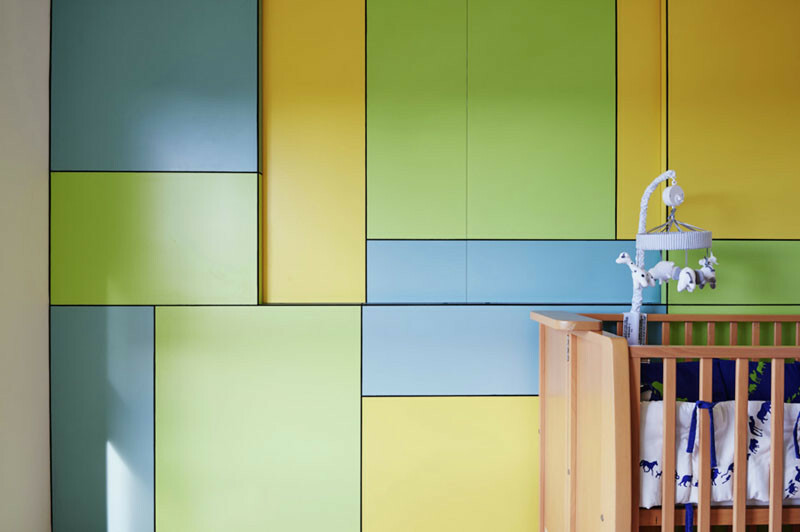 Back inside, there’s a wall of white cabinets, with fun pops of color. 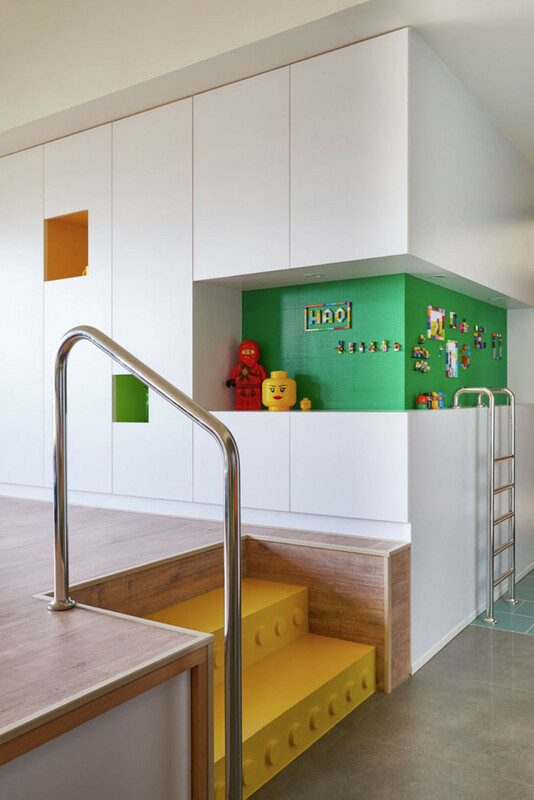 The home has a swimming-pool-style handrail and ladder. 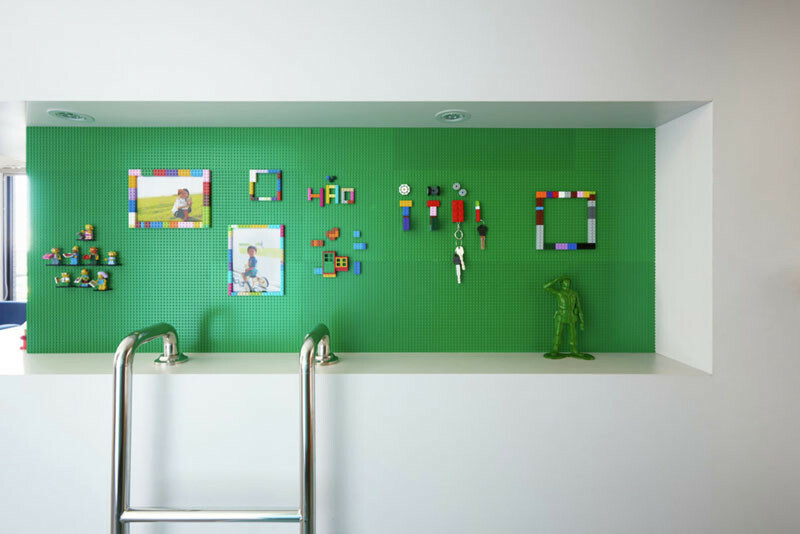 One of the colored sections on the wall of storage is full of Lego board. 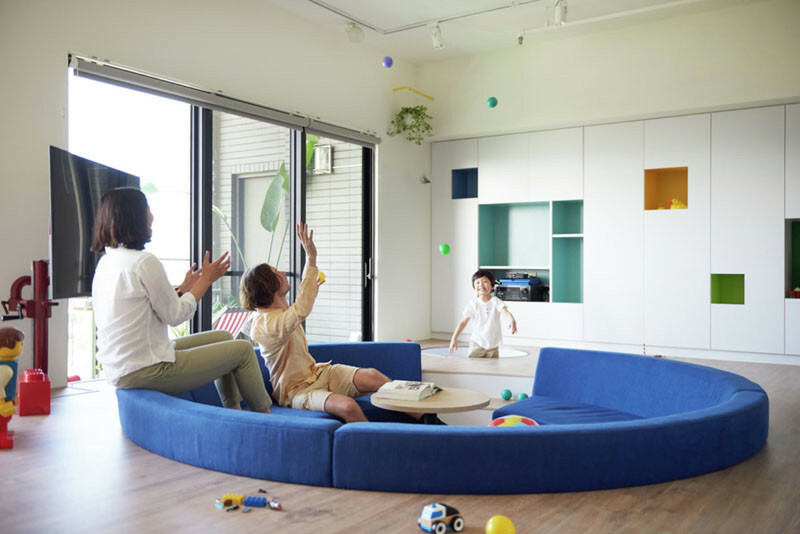 As the main living area is raised, there’s additional storage that has been tucked away underneath. 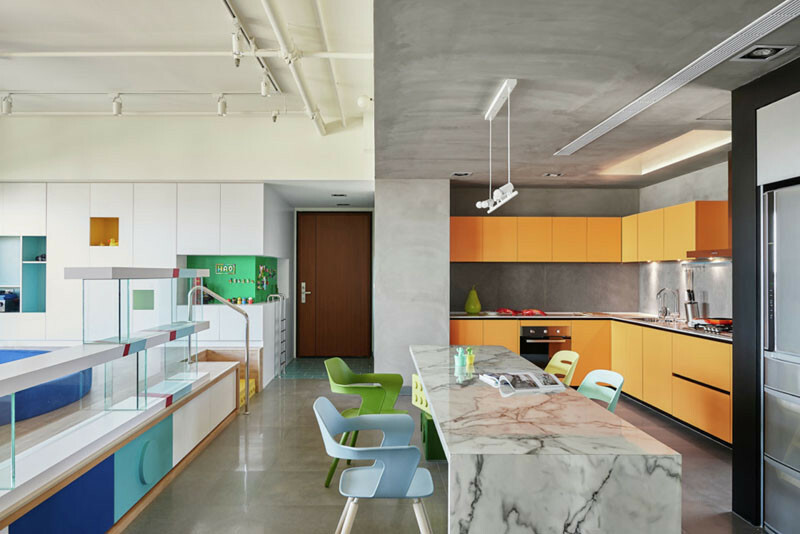 In the kitchen, bright orange cabinets carry on the playful theme. 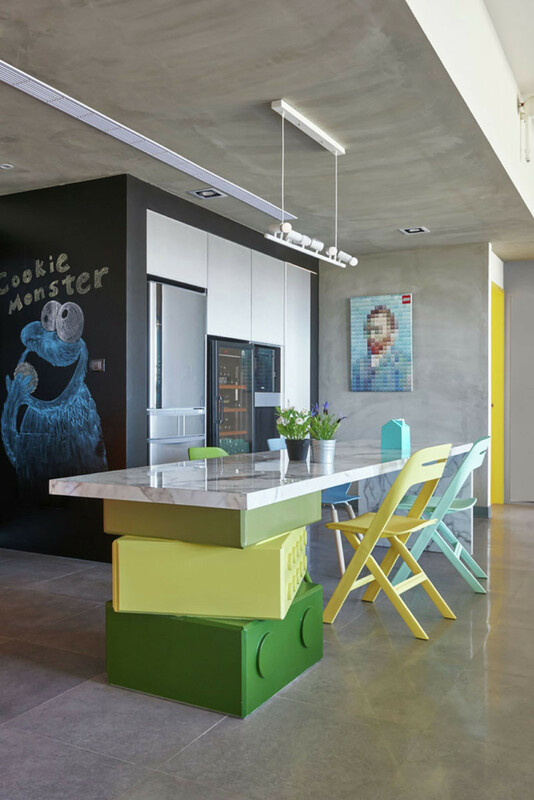 The large kitchen island, that also doubles as a dining table, is propped up by custom-designed blocks. 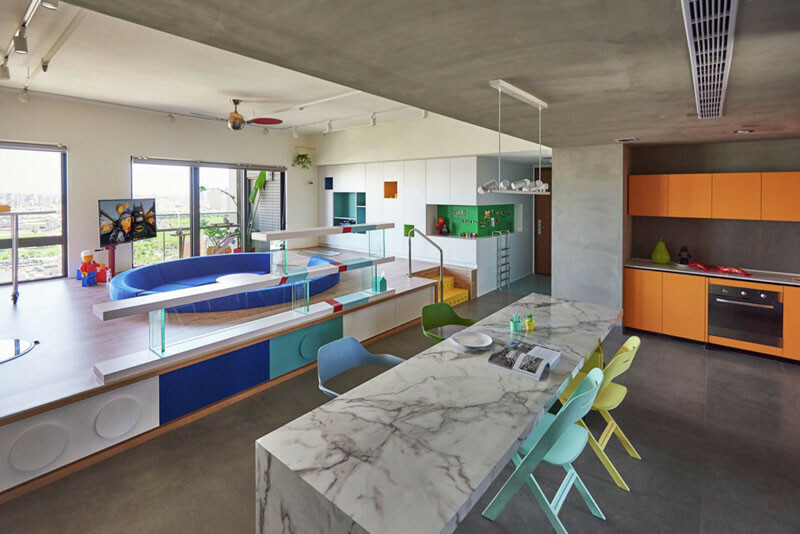 Those blocks are actually drawers, accessible from the kitchen side of the island. 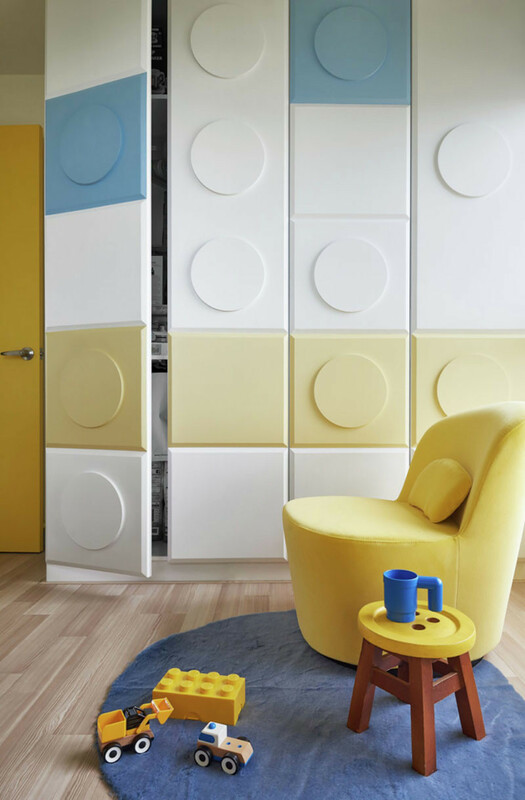 In the master bedroom, two of the walls have been covered in floor-to-ceiling storage. 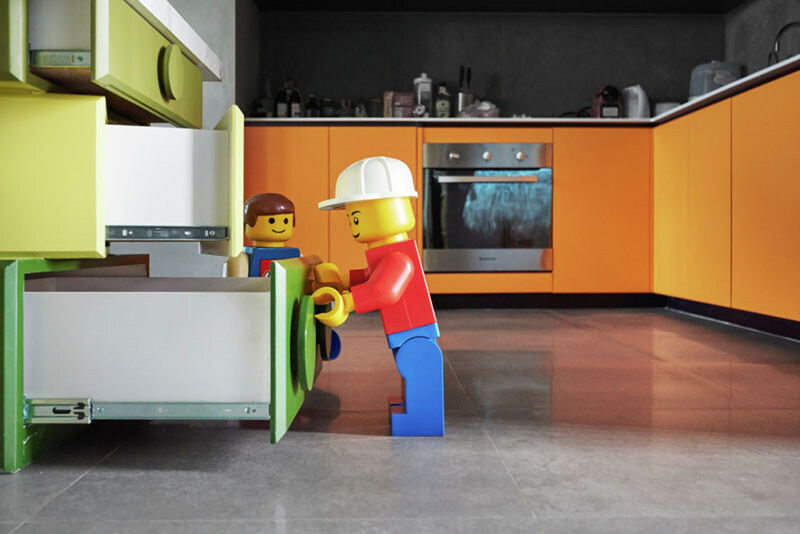 Touches of Lego-inspired decor, like the side tables and artwork, have been included as well. 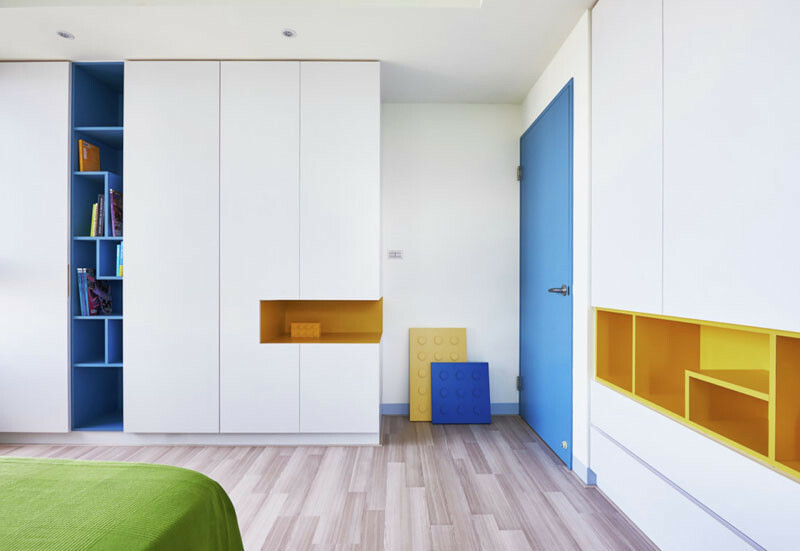 In the child’s bedroom, colorful cabinets line the wall.